Image by ryanophilly via FlickrEach year thousands of people head to Ligonier – just a quick 60 minute drive from Pittsburgh for a huge celebration that commemorates the battle of Ligonier which was one of the battles of the French and Indian War. The fort is still there and you can even watch a reenactment of the battle. I try to make it to Fort Ligonier Days each year for the parade on Saturday Morning and the food – it is the most amazing festival food I have ever found. 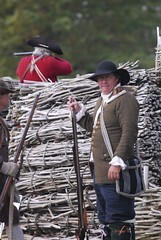 I definitly don’t want to miss the 250th Anniversary celebration at this years Fort Ligonier days. The fun starts on Friday morning, the parade is on Saturday and the events run through Sunday. All of the details with a complete schedule is available here. You can watch the battle reenactments at 2 & 4 on Saturday and Sunday at the Fort. The other reason to make the drive to Ligonier is the fall foliage – this is the perfect time of year to see the spectacular colors of leaves. I will be looking for candy corns and pumpkins and some apple cider too. While you are in Ligonier you MUST stop in to see Joe’s Bar – this place is spectacular, a different kind of spectacular than the leaves, but spectacular. Joe’s has one of the largest collections of taxidermy in the US – see pictures here. More pictures here and here.